Many families ponder the idea of adding extra living space for a few years before they are actually ready to remodel. Then, all-of-the sudden, something will happen that makes them realize that they can’t wait any longer. In the case of this remodeling story, it was the snowstorm of 2016 that spurred the homeowners into action. As the family was stuck in the house with nowhere to go, they longed for more space. The parents longed for a getaway spot for themselves that could also double as a hangout area for the kids and their friends. 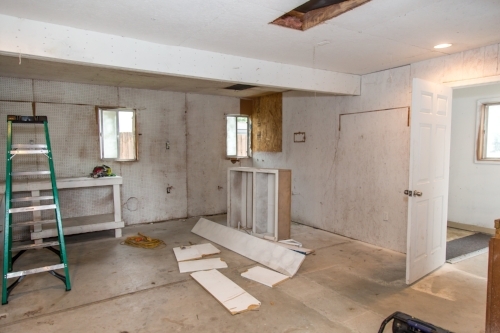 As they considered their options, there was one clear choice…to renovate the detached garage. The detached garage previously functioned as a workshop and storage room and offered plenty of square footage to create a family room, kitchenette, and full bath. It’s location right beside the outdoor kitchen made it an ideal spot for entertaining and provided an easily accessible bathroom during the summertime. Even the canine family members get to enjoy it as they have their own personal entrance, through a bathroom doggie door. Our design team listened carefully to our client’s wishes to create a space that had a modern rustic feel and found selections that fit their aesthetic perfectly. To set the tone, Blackstone Oak luxury vinyl plank flooring was installed throughout. The kitchenette area features Maple Shaker style cabinets in a pecan shell stain, Uba Tuba granite countertops, and an eye-catching amber glass and antique bronze pulley sconce. Rather than use just an ordinary door for the bathroom entry, a gorgeous Knotty Alder barn door creates a stunning focal point of the room. The fantastic selections continue in the full bath. A reclaimed wood double vanity with a gray washed pine finish anchors the room. White, semi-recessed sinks with chrome faucets add some contemporary accents, while the glass and oil-rubbed bronze mini pendant lights are a balance between both rustic and modern. The design called for taking the shower tile to the ceiling and it really paid off. A sliced pebble tile floor in the shower is curbed with Uba Tuba granite, creating a clean line and another accent detail. The new multi-functional space looks like a natural extension of their home, with its matching exterior lights, new windows, doors, and sliders. And with winter approaching and snow on the way, this family is ready to hunker down and ride out the storm in comfort and warmth. When summer arrives, they have a designated bathroom for outdoor entertaining and a wonderful area for guests to hang out. It was a pleasure to create this beautiful remodel for our clients and we hope that they continue to enjoy it for many years to come. Older PostWhat Do Reputable Remodelers Have in Common?